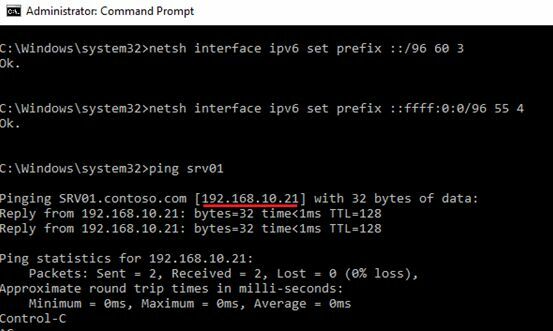 Home » Operating System » Windows » Ping returns IPv6 Address, ping IPv4? If you are on the same network, or VLAN, or subnet as someone else – you will probably notice that if you ping their hostname it will return with a IPv6 address. The fact is that the IPv6 protocol in Windows Vista and above is the preferred protocol over IPv4. As you can see, ping command returned standard IPv4 address. In the event that, when the client requests the server and it returns the IPv6 address, and there are some problems with the operation of some legacy applications, there is a more advanced solution. The solution is to increase the priority of the IPv4 over the IPv6 protocol, but with the continued operation of IPv6. Everything works as it should be. You can also change preferred IP protocol from GUI. To do it, open Control Panel -> Network and Internet -> Network Connections -> Advanced -> Advanced Settings. Tip. 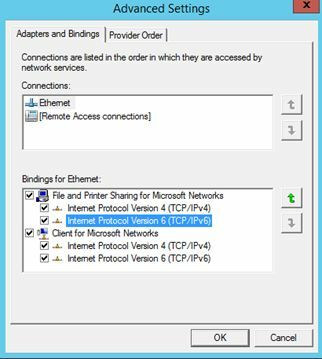 Adapters and Bindings dialog box is missing in a newest Windows 10/Windows Server 2016. Select your network connection and using green button set the IPv4 protocol above IPv6. You should perform this operation for all available bindings. If you are not using IPv6 there is no reason to have it enabled. To disable it, go to Network Connections, right click Properties on your NIC and then uncheck “Internet Protocol Version 6 (TCP/IPv6). Hope that helps! There is no way unfortunately to default to IPv4 like in command prompt. Unchecking the protocol binding is not sufficient to disable IPv6. It will seem to work at first, but you will eventually run into strange network problems that seem to defy any explanation. This is ESPECIALLY true for servers. To properly disable IPv6, see KB929852. The “Fix It” MSI available from this KB article is suitable for GPO deployment, no need to create a custom ADMX. Thank you dude! Helped me very much right now!! Till now i had to disable ipv6, reboot and at least but not last change the computername (in a automated tailoring of my system). Now i can rename after disabling, without a reboot! Thanks. The solution worked in our environment. There is a easier method that works for me. I just changed the interface metric # to determine its priority. I had used this method in the past to change priority of network adapters (Wireless NIC priority first, LAN NIC priority second), but I found out it works on TCP/IPv4 and TCP/IPv6 as well. In this case, I changed the interface metric of TCP/IPv4 from Automatic to 5, and TCP/IPv6 interface metric from Automatic to 10. The lower the metric number, the higher its priority. Then restart your PC. So now whenever I ping using the hostname, it will reply from IPv4, instead of Ipv6.